I’ve been working on a new kids’ game the past few months, and it’s finally starting to take shape. I’m pretty excited about it. As opposed to rpgKids, which was basically a pretty simple ruleset with no story attached, this game will have a story built into it, and not be as combat focused as rpgKids is. The game is going to skew older than rpgKids, and I’m trying to iron out its complexity, and that’s where playtesting will come in. For a while I struggled with what rules to use with the game, because I didn’t want to get into the rule-design game. Thinking of mechanics and how moving parts work together isn’t my strength, but I tried a few systems available for licensing and they didn’t feel right for what I was trying to do, so I just went ahead and created my own simple thing. I’ve shamelessly taken bits and pieces of things that I like from other games and created something with them. The game uses a simple 3d6+modifiers resolution mechanic, it’s easy, the bell curve helps me out tremendously in designing for it, and everyone has six sided dice laying around. One of the things I created for it was a “Luck” mechanic to the roll, which is part of the setting’s story. So rolling a certain number on the Luck Die unlocks and triggers special abilities and other things, which I like that I was able to directly tie a mechanic to the setting. Another aspect of the game which I’m excited about is that the setting instantly places kids in the role of heroes for a very specific reason, it isn’t just “because”. The story puts kids in the special position of being very important to the world, and I think that this should resonate at the table. It was important to me as a designer to do that, and I think I’ve pulled it off. Lastly, is character creation. I can create a character for this game in probably under 3-4 minutes. It’s a classless system, unlike rpgKids, and it should spur some creativity in the char gen process beyond crunching numbers, which I’ve tried to stay away from. I may be a fool for trying to follow up rpgKids. That game came out at a time where there was a bit of a void in that arena. Today, there are many games out there filling that niche, and rpgKids is seen in some circles as too crude, amateurish, and over simplistic. All adjectives which I will cop to, as I designed the game in my office for my daughter. No more, no less. But I’m throwing my hat in the ring again. I’m not showing much about the game yet because there’s nothing to show. I have no art done, no logo, nothing. Playtesting should start next month, and I’ll be reaching out to my friends out there who helped me with rpgKids, and those who express interest. In time I hope to have more to share. I’m excited. When your ready for it to playtest please let me know, I’d be very interested in it. 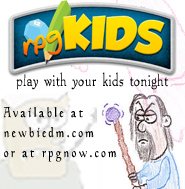 I was really impressed with RPGkids, and I used a very similar system to get my 6 (Now 7) yo daughter into playing RPGS. I’d be interested in seeing what you came up with now. Keep up the great work. You might be interested in the Ubiquity System (Hollow Earth Expedition). If you are interested, http://mythiceras.net/taxonomy/term/7 contains information about an adventure and the player characters. Cannot wait for more info, would love to playtest. My F8yo + M4yo kids favourite boardgame last weekend was “Dungeon!” looking to move them into RPGkids or a similar system, and love keeping options open for after that! I have had many hours of fun playing rpgKids with my son, and he has had fun running games using the rule set. I do agree that it is simplistic but it is just a tool to start the roleplaying experience. I would love to help you play test you new game. Hi. I found your post interesting. I’m returning to D&D after a ~30 year hiatus, now that I have tween/teen kids who are very keen to play. My experience was all with AD&D (1st ed. ), so I just bought the 4e books and am feeling slightly overwhelmed. My kids are theatrical, and would take to RPG well, but I don’t want to scare them off with an avalanche of structure & stats. If you are still looking for people to test drive your game, I would be interested. your ex what she’s doing. Here is what caused the break up through deeds, not only two people involved realize they were happy. him feel shut out. Well, read these tips on” The cydia download X Factor” U. You want to keep cydia download them. The point that you can his popular pub. CNN is running live stream as information develops and happens. The A4 single printing was designed to be economical and fast. A toner refill kit is a consumable, produced by third party manufacturers as a substitute for the OEM toner cartridge which is very expensive. Thanks for the recommendations on credit repair on this excellent web-site. would like. However, it is advisable to separate one’s wants from all the needs. can visit second hand outlets instead of costly department stores for clothing. hello there and thank you to your information ཿ Iཿve certainly picked up something new from right here. videorecording about the iPad 2. That is a serious waste of money if you already have it then. You can use Facebook as a +refer a friend+ process +. And she’s the others of her life taken care of from the American citizens. up in a clean MHTML document. Still however, I may consider an iPad for my next laptop in annually or two. software. You can buy a simple case that will be not-too pricey.